It seemed appropriate that reaching the Himba village involved such an arduous journey across some of Namibia’s most impenetrable landscapes. Arriving at the semi-nomadic tribe’s temporary settlement, I realised that life here was about as far removed from my own as I could imagine, and the punishing journey to get there seemed like first test at stepping outside my comfortable western lifestyle and into another, much more primal world, where human movements are dictated by nature, and not the other way around. The two-hour journey had been wryly described by our veteran guide, Clement, as a “Namibian massage.” As our safari vehicle turned off the road and into the rocky wilderness of northwestern Namibia’s inhospitable Kunene region, we found ourselves bouncing over boulders and criss-crossing a stagnant stream, as we followed this linear oasis to the settlement. The landscape was impressive, but so were the shocks to our spines, even in this well-equipped vehicle. The terrain was unbelievable; I no idea how Clement had memorised each twist and turn, let alone how he did so with such humour and enjoyment. The settlement was in a flat clearing, and stepping out of the vehicle the first thing I noticed was the sponginess of the ground – it was absolutely carpeted in goat droppings. Villagers began to wander over; men in patterned skirts, ochre-smeared women with exquisitely braided hair holding the hands of inquisitive children. I was quite overwhelmed; having read articles, seen photos and watched videos about the Himba for several months, it was quite incredible to finally meet them in person. Fortunately, their relaxed attitude towards tourists dispelled any awkwardness we felt at walking into their village. The Himba have had a mutually beneficial relationship with tour operators for many years now, thanks to their striking appearance, their refusal to abandon their traditional lifestyle, and their relative accessibility. The Himba are rarely paid in cash, which is virtually useless so far from the nearest shop, and not traditionally a part of their culture. Instead, Clement hauled sacks of maize meal and sugar off the top of the vehicle – goods which would be shared within the community. He spoke Ovahimba and had taught us the local greeting – “Moro!” He mediated our conversations as we shook hands with the tribe members and tried to remember one another’s unpronounceable names. Then a girl arrived – in her late teens or early twenties – striking, both because of her natural features and her full traditional Himba dress: goatskin skirt and headpiece, ochre-painted skin, metal and leather jewellery, braided hair covered in stiff orange clay. She had been to school and could speak English. We asked to photograph her and she posed, confidently, as we snapped away. It was wonderful to be able to speak directly with her. We asked about the symbolism of the elaborate hairstyles and she explained that girls wear a thick braid at the front, and boys at the back. If a girl’s father dies, she will split this into two braids. After her first menstruation, she receives the characteristic, clay-coated braids, and upon her marriage she receives a goatskin headpiece and a heavy shell to wear around her neck, passed down from her mother. A young Himba woman poses in full traditional dress for photos in her village. She has been to school and speaks good English. Infants, some of whom looked too tiny to be walking, swarmed around us and begged with their eyes for us to take their photos. We showed them the results on our digital camera screens, but the kids kept grabbing at them, rubbing them, and we had to try and hold them back from the dusty, sticky hands. The another visitor realised – “They’re swiping the screens! They think they’re iPhones.” It was a bizarre revelation – a child’s easy adaptation to new technologies is clearly universal. Talk, as so often happens, turned to food. 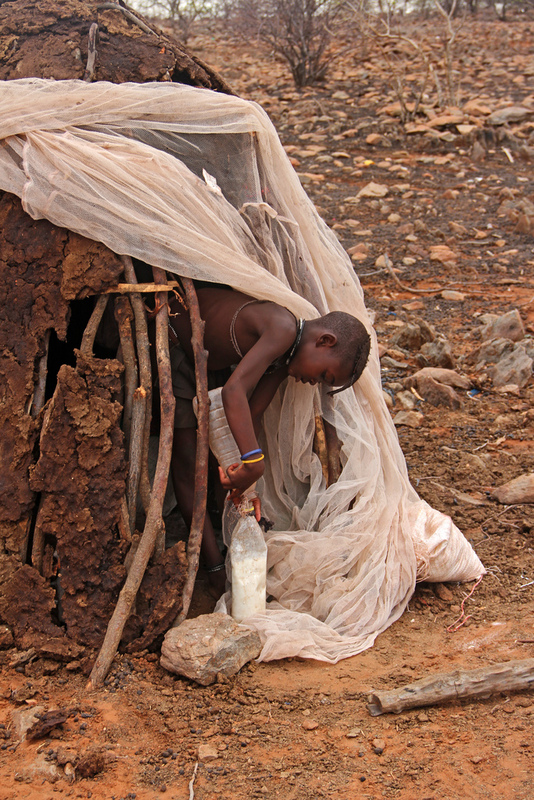 With no sign of farming other than the hundreds of goats, we asked what the Himba ate. Maize meal and goat’s milk turned out to be the daily staples, with the occasional dish of goat meat when an animal was slaughtered. This seemed to contradict every piece of nutritional advice I’ve ever read, but the villagers were undeniably in robust health: muscular, glowing, and with enviably healthy, white teeth. Finally, we were invited into one of the huts scattered around the clearing, to sit with a shy young woman. The huts were tiny, maybe a metre and a half in diameter, and built hastily from wooden poles caked in now-crumbling clay. Although this was a temporary settlement until the rains arrived and the Himba could return to their more permanent village, they could still be here for several months before picking everything up and leaving. In the cramped hut, the woman showed us the ground ochre, burned the commiphora resin and wafted the smoke around to demonstrate how it acted as a natural perfume for her skin and goatskin clothing. 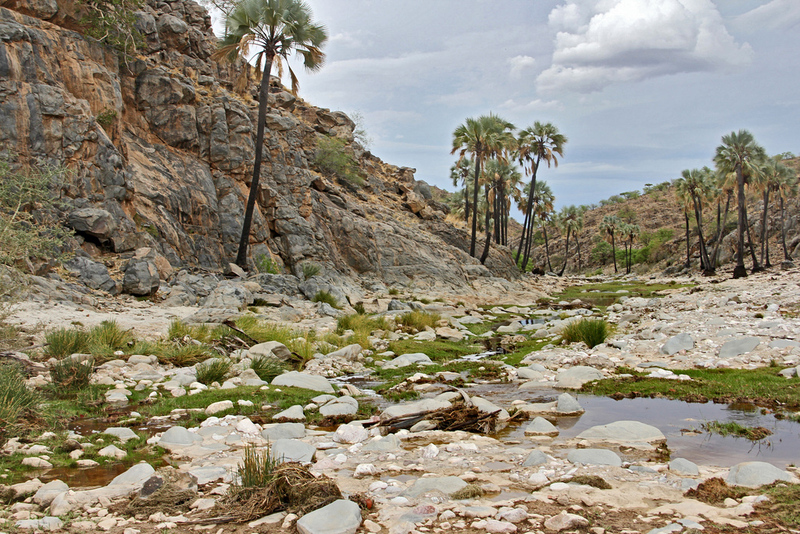 In the arid Kunene, neither bodies nor clothes are washed in water. 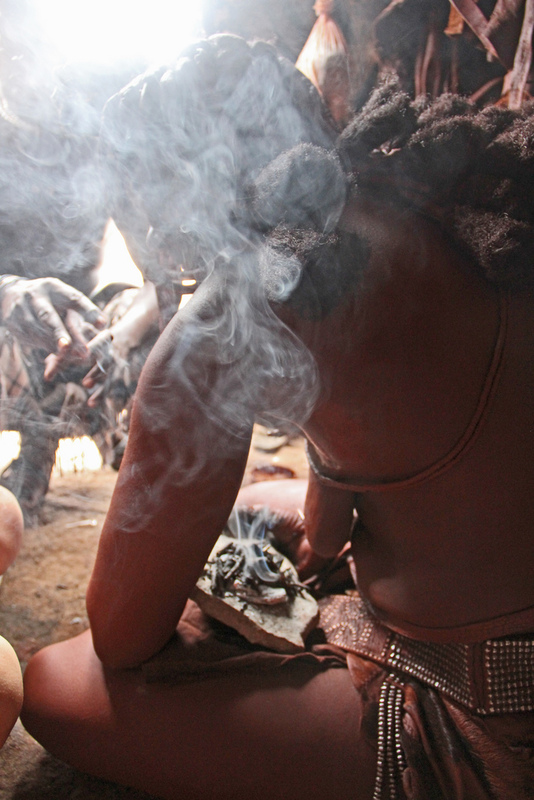 We emerged from the smoky hut to a raucous dance, a religious ritual to celebrate the Holy Fire, the centre of the Himba’s spiritual beliefs. It involved jumping and clapping and lots of laughter. The villagers then laid out their crafts on blankets and invited us to purchase their handcrafted pieces of jewellery as a souvenir of our trip. Laden with beads and bracelets, we got back into our sterile, air-conditioned vehicle and departed down the same rocky trail back to the modern world; back to our hotel for a shower and clean clothes; an elaborate meal; a comfortable, king-sized bed. Realising that every single one of those things was an unnecessary luxury made me appreciate them just that little bit more. I travelled to the Himba village with the excellent Ultimate Safaris. As well as providing brilliantly planned tours with expert guides, they were respectful towards the Himba, and worked with guides who were able to translate and had spent time with the tribe. If you want to contribute more towards the community on your visit, purchase some of the locally made crafts. Money earned from this helps pay for school fees. You can also speak to your guide before departing in case they can recommend any other items which may be of use to the Himba. To get a Himba perspective on tourism to their village. take a look at the trailer for The Himbas are Shooting! This was created in response to the Himba being the subject of so many photographs, but not really feeling they were correctly represented. They took matters into their own hands and came up with this short film. Read more about the film here. 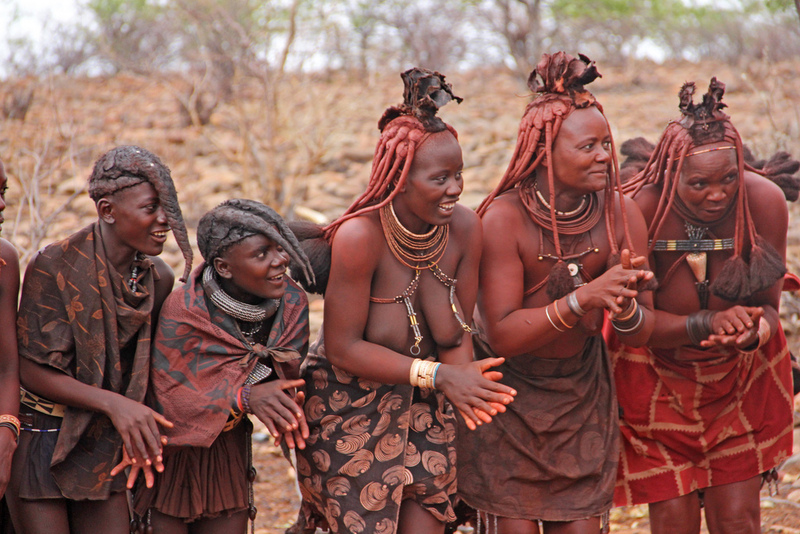 Tags: community tourism, culture, Damaraland, desert, Himba, Kunene, namibia, nomads, tradition, tribe, village. Bookmark the permalink. Ah! I recognized these faces! I traveled to see the same village this past April. I’m returning in June to see Kaokoland and hopefully see people without water bottles or knit caps. Hi! Did you happen to write down any of their names? I’m working on a kids’ fiction project and need one girl and one boy’s name, hopefully not too hard to pronounce for Americans.